My first sighting of Norway is of snow-covered mountains; unsettling! I’ve got to travel 1500 miles north to get to my ‘starting point’ - North Cape - and that can only mean a lot more snow. It’s late afternoon. I cycle forty miles and camp by the sea in the field of a friendly farmer. My tent’s the easiest to erect that I’ve ever used and it’s up in five minutes. I’ve already fallen in love with the compactness and lightness of my Trangia stove now firing up my staple diet of tuna and noodles. My sleeping bag is a marvel - a cross between a warm cocoon and a disappearing act. I can’t believe how camping equipment over my forty years of experience has quartered in weight and size and yet doubled in efficiency. I’m exhausted. The hardest part of adventuring is often the starting. Well, I take that back. The hardest part was Day 2. I was inches from being wiped out by a lorry. I never realised it was behind me, racing me downhill towards a single-track bridge, and I was going to win. I was wearing luminous orange (Vango backpack cover) but he never saw me until I was ten meters from the narrow entrance when he sounded his horn. In shock I slammed on my brakes and managed to stop in time, and he roared past grazing my outer pannier. An hour later I came to a 13-km tunnel where bicycles were banned. 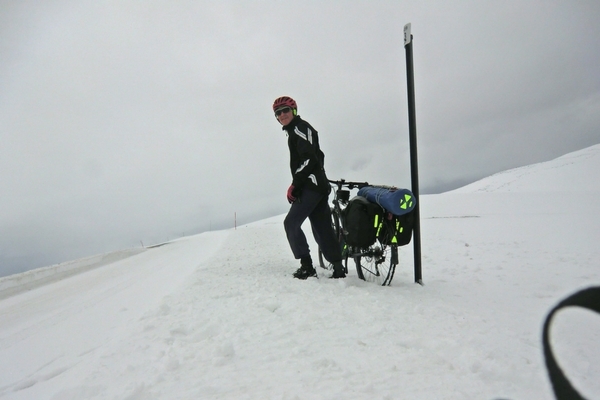 The ’alternative route’, the old road over the mountain, was under 2 meters of snow. I managed to hitch through this one, go illegally through others but the tunnels and the dangerous lorries became too much. The risks were too great, the progress too slow. I took buses and a train far up north to Tromso. Winter was a month late in leaving and I was heading into the snow land, still 450 miles short of the ‘start’. 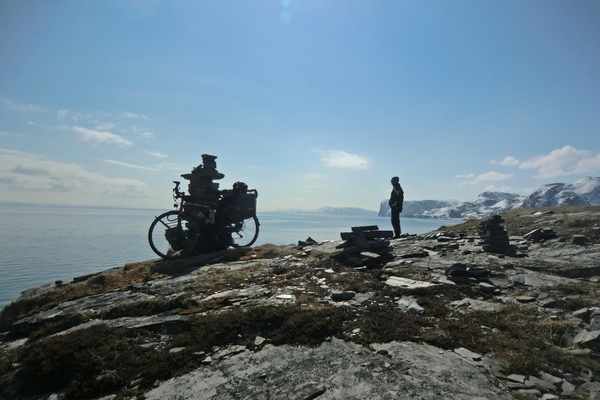 The mountain scenery was magnificent and my days fell into a regular routine of 10 hours in the saddle, 80-100 miles a day, camping on snow in the few spots of Norway that are not rock, cliff, bog, tree or otherwise occupied. North Cape, regarded (incorrectly) as the most northerly point in Europe, is a large carpark atop 1000-foot cliffs. The temperature was -2ºC and the road was sheathed in ice which sent me sprawling on the last mile. I was thrilled to be there, and even more thrilled to leave! At that moment I was closer to the North Pole than to my destination of Stockholm, 1300 miles to the south. It took 16 days to get there, days filled with endless forests, iced-over lakes and reindeer that preferred the snow-free road and ran in panic before me for kilometres at a time. Winter turned to spring, the forests to meadows studded with yellow flowers. Wild camping was easy and I would have been blissfully happy if my feet weren’t suffering some nerve torment from my studded pedals. This was a shake-down trip to iron out problems for future stages. So how was it? It was beautiful and hellish and wonderful but overall, they were 1,942 hard, hard miles in just under a month. Watch this space for Stage 2 of Alistair’s epic cycle! 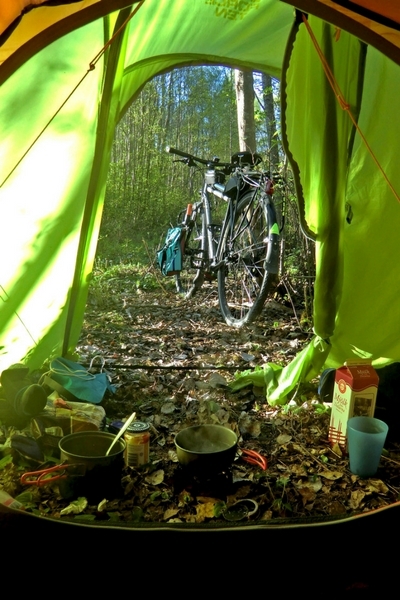 Thanks Alistair for blogging your cycling journey, I look forward to future updates!